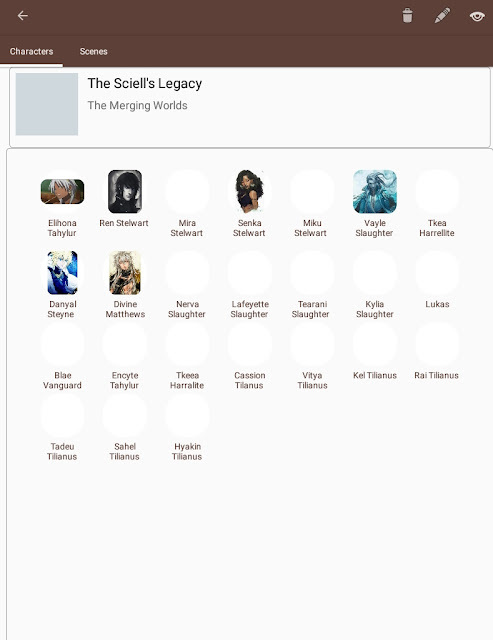 I have a problem with Book 4, The Sciell's Legacy. There are a lot of characters, like a lot. I struggled with this is Book 2 and 3 as well. In the post: Writing a Large Cast, I listed some helpful articles on managing an ensemble cast. I didn't set out to write a story this big. It just happened that way. The plight of a panster. We don't outline so it's not uncommon for stuff like this to happen. If you find yourself with an epic cast, how can you manage them all? It's a bit too much to keep all those characters in my head. A simple list helps me see exactly who I'm working with to, maybe, cut down the cast. 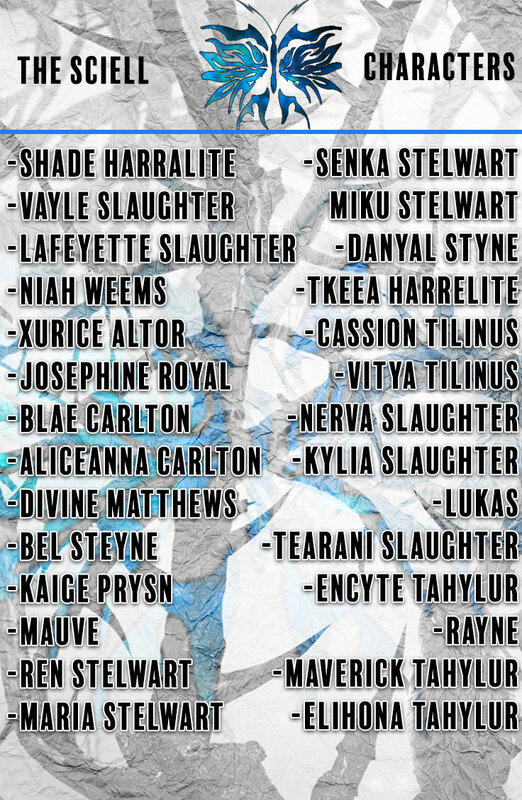 To keep this list post non-spoilerly, I'll be using my character's maiden names. In The Sciell's Legacy, it's not called maiden though. It'd just the name before they bonded with their partners. As the story progresses, some characters are meeting people who may end up traveling with them. So, that's adding more characters to the list. And, I just realized I missed the parents of some of these characters. That's too much. I may have to kill some more characters between books 3 and 4 and have some who are away. They aren't dead, they just aren't close by when the story happens. Right now, I'm modeling after Avengers: Infinity War. All of these characters aren't together. They're in groups traveling somewhere to different locations. By the end, they'll be in the same location. I'll need to break out the Excel spreadsheet to keep track of the character's locations in each chapter and how many days pass for them. All these characters are in the book but only a few will have chapters told from their point-of-view. Right now it's Josephine, Divine Blae, Ren, Encyte, Elihona, Cassion, Shade and Rayne. Maybe Maverick but we'll see. He's been in the background for Books 1-3. I'd like him to have a bigger role in Book 4. Some of my characters have adopted children but right now, they're just called Niah's children, for instance. They aren't named. But I might change this aspect of the story. Some characters may not start the book with adopted children. They may end up adopting a lost child they meet during their travels. 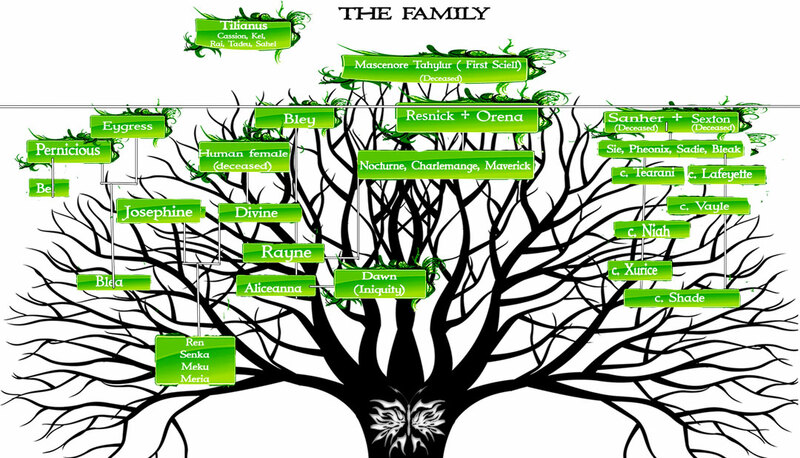 All the books in The Merging Worlds Series have a family tree to help readers keep track of who's related to who. Maybe I'll add an index to the back of the book but, do readers actually look at that? I never do. 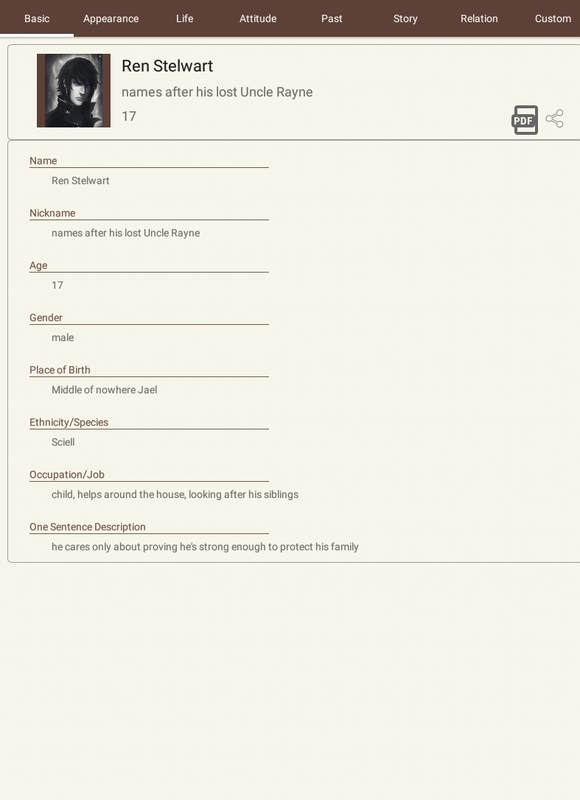 I started using Character Planner on Android to keep track of the cast in The Sciell's Legacy and also to flesh out their backstory. It's great when I'm walking about, I get inspiration for a character's backstory and I can't pull out a journal, like when I'm on the train in the morning. In an ensemble cast, all the characters have about the same weight. They can't just be the comic relief or the obstacle. They need to have agency. Personality: Pretends to be tough but is a really big softy. He has his view of the world and he doesn’t care that you don’t share that view. He won’t force you to see what he sees. As long as his children are happy, nothing else matters. Has always been a bit too independent. Not necessarily a loner. He enjoyed traveling with his siblings as a child but he also liked going off on his own and was often annoyed when his younger siblings clung to him. When he’s unattached, he gets antsy when he’s been in one place for too long but when he started a family he never wanted to leave them. Soul Wound: Was unable to properly protect his human wife and child when the Del’Praeli attacked his home. They were wounded but survived. Maverick realized because of what he was, he could never have the family he dreamed of. A century later, out of loneliness, he became attached to a group of people with a warped sense of survival but he stayed with them and married of one. In order to stay with them, he hides what he really is. His daughter doesn't even know what she really is. He's denying one part of his family to keep the other. I have to do this with every character. As you can imagine, it takes a lot of time but it's worth it if you want to create well-rounded characters. As I mentioned before, groups of characters are all in separate locations. You meet them as you travel to each location. It'll get a bit confusing to the reader if they meet all your characters at once. This can be a bit tricking if the characters are related. The Merging Worlds series is a family saga so most of my characters are related. For families, I give them a shared feature like they all have like red eyes or white hair. Or a shared personality, like they have a bad temper or they're very good at lying. I might publish a blog post about writing families. Writing is work. 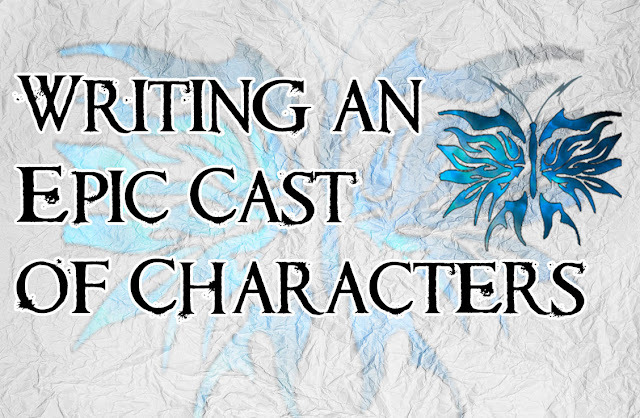 Writing a large cast is more work. When I edit my stories, I try to remove as many one-off characters as I can. I try not to name one-off characters. You're readers don't need to know the name of the innkeeper if all they're doing is serving your characters food. I've deleted scenes I loved because it added a character that would only show up in that scenes and didn't add much to the story.